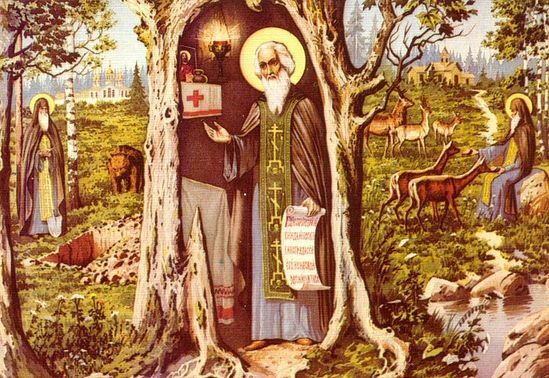 The holy abbot Tikhon of Kaluga embraced monasticism in his youthful days in Moscow, then he labored for many years in a forest in the hollow of a huge oak near the town of Medin in the Kaluga province. He founded a monastery on that very spot dedicated to the Dormition of the Mother of God and he was its abbot. St. Tikhon died on June 16, 1492. His holy relics at first were openly exposed in the monastery's main cathedral. But, due to frequent raids on the monastery and the monastery's final destruction, the monks buried the holy relics in the earth where they remained until the time of the Russian revolution. In time, on the spot where St. Tikhon was buried, the magnificent cathedral of the Transfiguration was erected with five altars, and over his very grave was built an artistically designed reliquary, on which there was placed a large icon of St. Tikhon. A large canopy was constructed over the reliquary, three sides of which were adorned with silver hanging lampadas. The reliquary was located on the right side of the cathedral near the cliros of the main Transfiguration altar. The inside of the five domed Cathedral had a marble-like finish, and was decorated in a rich and ornate manner. Not long before the revolution, St. Tikhon's monastery, which had retained the title of a desert hermitage, "blossomed like a lily" and was one of the best established of all desert monasteries. 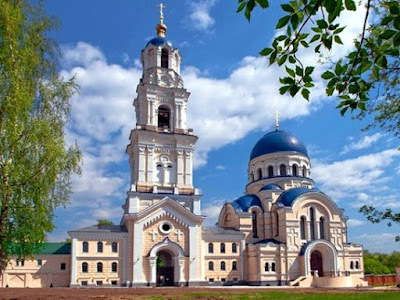 There were two magnificent cathedrals in the monastery, that of the Transfiguration, which was the winter church, and a new beautiful summer cathedral dedicated to the Dormition of the Mother 6f God. There was erected an elegant belfry with huge bells. In 1906 they hung a new immense bell that weighed 32 tons which could be heard far away in the villages, towns and ranches. In 1909 a large refectory with a church dedicated to St. Nicholas was consecrated. There was another large church near the monastery infirmary. The monastery had many monastic structures including three guest houses outside the monastery wall. About two miles from the monastery was the spring of St. Tikhon, a church, two separate enclosed pools built into the healing well, one for men and the other for women, and two houses where the monastic brotherhood, consisting of 7 or 8 monks, lived at that time. Eight miles from the monastery was a skete dedicated to the Meeting of the Lord inhabited by 30 monks. In the skete the humble and quiet brotherhood spent its time in hard ascetic labors. The skete was located deep in the forest, and only later did the sound of the railroad tracks which were constructed nearby disrupt the quietness of this wondrous spot in one of the most picturesque areas of the Kaluga region. God granted me to live in St. Tikhon's monastery for about six years, becoming well acquainted with the entire expanse of the monastery. Before the First World War there were 250 brothers in the monastery. 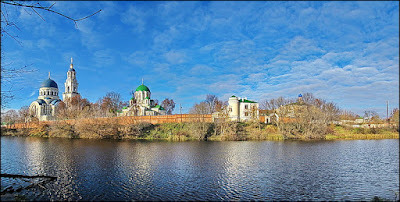 The monastery owned much land, many farms and a well constructed house (metochia) in Kaluga. It is not true, as the Bolsheviks wrote, that the monastery had millions of rubies, and that all the money was lost, having supposedly been deposited in German banks. There was nothing of the sort! I knew the last three of the monastery's archimandrites, Moses, Lawrence, and Platon, and I knew well that they were true monks, patriotic sons of their Mother Russia. They were all of peasant stock and were far from being so cunning as to send the monastery capital overseas. This is a lie, a slander of the godless ones upon monasticism. I know well that the monastery had a lot of land and a lot of income from this land, but with this the monastery would help many people. There was no set price for pilgrims to stay in the guesthouse, they would donate whatever they could. All poor people were fed and given lodging free of charge. Everyone would receive rye bread and kvas. The monastery infirmary was open to lay people and all local peasants and farmers who lived in the vicinity of the monastery. Medical assistance and medicines were given free of charge. In April, 1908, there was a frightful flood throughout all of Russia. This occurred also in a region where many villages were washed away by the water. The monastery rendered assistance in every way possible to those who had suffered. The monastery also operated a school for village boys out of which the boys were later able to become teachers and businessmen or take up other professions. I cannot recount all the charitable things the monastery did. St. Tikhon was a great miracle worker. From all corners of the wide Russian land people would gather at his grave. There were many miracles which took place at the shrine of his relics and also at his spring. Even during my stay there the Lord worked great miracles at his relics and at the spring. A twelve year old paralyzed peasant girl who was carried there in her mother’s arms was miraculously healed. During the moleben, when the hieromonk placed the Holy Gospel on the head of the sick girl, she stood on her feet and loudly exclaimed: "Mother! Mother, I can walk! I am now healthy." Everyone in the church saw the miracle and wept. Many newspapers wrote about this miracle. Here is another great miracle which I shall never forget. I do not remember the exact year but the details of that miracle I well recall. During the days of Great Lent a sick young girl was brought to the monastery whose arms and legs were paralyzed. She had to be wheeled around the church. Pascha was late that year. It was warm and green everywhere. On the third day after Pascha the sick girl was brought to the spring of St. Tikhon and the women, having placed her on a sheet, immersed her into the cold running spring water. And what do you think happened? The girl, already condemned by the luminaries of the medical sciences, stood up on her legs and by her self came out of the water. In 1914, on the eve of April, I myself saw her in one of the convents absolutely healthy, rosy-cheeked, and working in the garden. In gratitude for her healing she dedicated her whole life to the service or God by joining the ranks of monastics. There were also a great multitude of other miracles. I was the cell-attendant of the archimandrite and I know for sure that people would write; some would ask for holy water, holy oil, and prosphoras, while others would ask that a vigil or moleben would be served to Saint Tikhon. During the summertime the requested vigils to St. Tikhon would be held quite often, but then 1918 arrived and the beautiful monastery of St. Tikhon was taken over and defiled by the godless ones. The monks were forced to leave, the holy things were desecrated, the bells and crosses taken down. It is difficult for me even to remember that. My tears do not allow me to write. St. Tikhon was highly revered by the pious Muscovites who considered him their own saint because, "He embraced monasticism in the city of Moscow." He was also highly revered in our northern capital, the city of St. Peter; for in the grounds of his monastery many residents of St. Petersburg found their eternal rest. In the basement church of the Transfiguration Cathedral there were many dignitaries buried who spent the last days of their lives inside the walls of the holy monastery. The former governor of Alaska, Symeon Ivanovich Yanovsky, and his son, hieroschemamonk Christopher, were buried there. Many were buried around the Transfiguration Cathedral. Before the bloody revolution, on the monastery grounds, there was order and cleanliness. The graves were taken care of, and over many of them there were beautiful memorial stones and burning lampadas. And then came that red Beast, that terrible bloody dragon to the Russian land and he destroyed and defiled everything. But it is not the first time that the holy monastery of St. Tikhon was destroyed. In the past, its church buildings and walls were destroyed. It seemed that there would never be anything there again. But then the terrible times would pass and the Lord would cleanse Holy Russia from all impurity and again the holy places of Russia would be resurrected and just as other monasteries were, St. Tikhon's monastery would become an oasis in the desert wasteland. Again it would rise from the rubble and ashes and it would become like other Russian monasteries, a seedbed of enlightenment, a spiritual school of Orthodox culture. The disciples of the holy fathers would settle at the ruins, they would clean up the holy place and once again would build temples of God and all that is necessary to sustain the life of man. One wants to believe that the time will come when, on the Russian land, will shine again the bright Sun of Christian Love, Christian Peace, and Christian Brotherhood, when again the temples of God will be reopened, the lamps under its vaults will burn again like bonfires of candles. Then the monks, and with them all Orthodox people will sing, "Rejoice and be glad, O holy and God-pleasing desert who has nurtured our praiseworthy father, Tikhon." So be it, so be it.